Passover (Hebrew, Yiddish: פֶּסַח Pesach, Tiberian: , Israeli: Pesah, Pesakh, Yiddish: Peysekh, Paysakh) is a Jewish and Samaritan holy day and festival commemorating the Hebrews' escape from enslavement in Egypt. In the narrative of the Exodus, the Bible tells that YHWH inflicted ten plagues upon the Egyptians before Pharaoh would release his Hebrew slaves, with the tenth plague being the killing of all of the firstborn, from the Pharaoh's son to the firstborn of the dungeon captive, to the firstborn of cattle. The Hebrews were instructed to mark the doorposts of their homes with the blood of a spring lamb and, upon seeing this, the spirit of the Lord passed over these homes, hence the term "passover". When Pharaoh freed the Hebrews, it is said that they left in such a hurry that they could not wait for bread to rise. In commemoration, for the duration of Passover, no leavened bread is eaten, for which reason it is called "The Festival of the Unleavened Bread". Matza(unleavened bread) is the primary symbol of the holiday. This bread that is flat and unrisen is called Matzo. Together with Shavuot ("Pentecost") and Sukkot ("Tabernacles"), Passover is one of the three pilgrim festivals (Shalosh Regalim) during which the entire Jewish populace historically made a pilgrimage to the Temple in Jerusalem . Samaritans still make this pilgrimage to Mount Gerizim , but only men participate in public worship. Passover begins on the 14th day of the month of Nisan, which corresponds to the full moon of Nisan, the first month of the Hebrew calendar, in accordance with the Hebrew Bible. Passover is a spring festival, so the 14th of Nisan begins on the night of a full moon after the vernal equinox. To ensure that Passover did not start before spring, the tradition in ancient Israel held that the 1st of Nisan would not start until the barley is ripe, being the test for the onset of spring. If the barley was not ripe an intercalary month (Adar II) would be added. However, since at least the 12th century, the date has been determined mathematically. In Israel, Passover is the seven-day holiday of the Feast of Unleavened Bread, with the first and last days observed as legal holidays and as holy days involving abstention from work, special prayer services, and holiday meals; the intervening days are known as Chol HaMoed ("festival days"). Diaspora Jews historically observed the festival for eight days, and most still do. Reform and Reconstructionist Jews and Israeli Jews, wherever they are, usually observe the holiday over seven days. The reason for this extra day is due to enactment of the Sages. It is thought by many scholars that Jews outside of Israel could not be certain if their local calendars fully conformed to practice of the temple at Jerusalem, so they added an extra day. But as this practice only attaches to certain (major) holy days, others posit the extra day may have been added to accommodate people who had to travel long distances to participate in communal worship and ritual practices; or the practice may have evolved as a compromise between conflicting interpretations of Jewish Law regarding the calendar; or it may have evolved as a safety measure in areas where Jews were commonly in danger, so that their enemies could not be certain on which day to attack. Karaite Jews and Samaritans use different versions of the Jewish calendar, which are often out of sync with the modern Jewish calendar by one or two days. In 2009, for example, Nisan 15 on the Jewish calendar used by Rabbinical Judaism corresponds to April 9. On the older Jewish calendars used by Karaites and Samaritans, Abib or Aviv 15 (as opposed to 'Nisan') corresponds to April 11 in 2009. The Karaite and Samaritan Passovers are each one day long, followed by the six day Festival of Unleavened Bread - for a total of seven days. In the first month, on the fourteenth day of the month between the two evenings is the LORD'S Passover. And on the fifteenth day of the same month is the feast of unleavened bread unto the LORD; seven days ye shall eat unleavened bread. In the first day ye shall have a holy convocation; ye shall do no manner of servile work. And ye shall bring an offering made by fire unto the LORD seven days; in the seventh day is a holy convocation; ye shall do no manner of servile work. The biblical regulations for the observance of the festival require that all leavening be disposed of before the beginning of the 15th of Nisan. An unblemished lamb or goat is to be set apart on Nisan 10, and slaughtered on Nisan 14 "between the two evenings", a phrase which is, however, not defined. It is then to be eaten "that night", Nisan 15, roasted, without the removal of its internal organs with unleavened bread and bitter herbs. Nothing of the sacrifice on which the sun rises may be eaten, but must be burned. The sacrifices may only be performed in Jerusalem. Some of these details can be corroborated, and to some extent amplified, in extrabiblical sources. The removal (or "sealing up") of the leaven is referred to the Passover Papyrus, an Aramaic papyrus from 5th century BCE Elephantine in Egypt. The slaughter of the lambs on the 14th is mentioned in The Book of Jubilees, a Jewish work of the Ptolemaic period, and by the Herodian-era writers Josephus and Philo. These sources also indicate that "between the two evenings" was taken to mean the afternoon. Jubilees states the sacrifice was eaten that night, and together with Josephus states that nothing of the sacrifice was allowed to remain until morning. Philo states that the banquet included hymns and prayers. And thou shalt remember that thou wast a bondman in Egypt; and thou shalt observe and do these statutes." The verb "pasàch" ( ) is first mentioned in the Torah account of the Exodus from Egypt ( ), and there is some debate about its exact meaning: the commonly held assumption that it means "He passed over", in reference to God "passing over" the houses of the Hebrews during the final of the Ten Plagues of Egypt, stems from the translation provided in the Septuagint (παρελευσεται in , and εσκεπασεν in ). Judging from other instances of the verb, and instances of parallelism, a more faithful translation may be "he hovered over, guarding." Indeed, this is the image used by Isaiah by his use of this verb in Isaiah. 31:5: "As birds hovering, so will the Lord of hosts protect Jerusalem; He will deliver it as He protecteth it, He will rescue it as He passeth over" (כְּצִפֳּרִים עָפוֹת—כֵּן יָגֵן יְהוָה צְבָאוֹת, עַל-יְרוּשָׁלִָם; גָּנוֹן וְהִצִּיל, פָּסֹחַ וְהִמְלִיט.) ( ) Targum Onkelos translates pesach as "he had pity",The English term "Passover" came into the English language through William Tyndale's translation of the Bible, and later appeared in the King James Version as well. The term Pesach ( ) may also refer to the lamb or kid which was designated as the Passover sacrifice (called the Korban Pesach in Hebrew). Four days before the Exodus, the Hebrews were commanded to set aside a lamb. ( ) and inspect it daily for blemishes. During the day on the 14th of Nisan, they were to slaughter the animal and use its blood to mark their lintels and door posts. Up until midnight on the 15th of Nisan, they were to consume the lamb. Each family (or group of families) gathered together to eat a meal that included the meat of the Korban Pesach while the Tenth Plague ravaged Egypt. In subsequent years, during the existence of the Tabernacle and later the Temple in Jerusalem , the Korban Pesach was eaten during the Passover Seder on the 15th of Nisan. However, following the destruction of the Temple, no sacrifices may be offered or eaten. The Seder Korban Pesach, a set of scriptural and Rabbinic passages dealing with the Passover sacrifice, is customarily recited during or after the Mincha (afternoon prayer) service on the 14th on Nisan. The story of the Korban Pesach is also retold at the Passover Seder,meaning order, and the symbolic food which represents it on the Seder Plate is usually a roasted lamb shankbone, chicken wing, or chicken neck. When the Temple in Jerusalem was standing, the focus of the Passover festival was the Korban Pesach (lit. "Pesach sacrifice," also known as the "Paschal Lamb"). Every family large enough to completely consume a young lamb or Wild Goat was required to offer one for sacrifice at the Jewish Temple on the afternoon of the 14th day of Nisan, and eat it that night, which was the 15th of Nisan. If the family was too small to finish eating the entire offering in one sitting, an offering was made for a group of families. The offering could not be slaughtered while one was in possession of leaven, and had to be roasted, without its head, feet, or inner organs being removed and eaten together with matzo (unleavened bread) and maror (bitter herbs). One had to be careful not to break any bones from the offering, and none of the meat could be left over by morning. Because of the Korban Pesach's status as a sacred offering, the only people allowed to eat it were those who have the obligation to bring the offering. Among those who can not offer or eat the Korban Pesach are: An apostate ( ), a servant ( ), an uncircumcised man ( ), a person in a state of ritual impurity, except when a majority of Jews are in such a state (Pesahim 66b), and a non-Jew. The offering must be made before a quorum of 30 (Pesahim 64b). In the Temple, the Levites sing Hallel while the Kohanim perform the sacrificial service. Men and women are equally obligated regarding the Korban Pesach (Pesahim 91b). Women were obligated, as men, to perform the Korban Pesach and to participate in a Seder. Today, in the absence of the Temple, the mitzvah of the Korban Pesach is memorialized in the Seder Korban Pesach, recited in the afternoon of Nisan 14, and in the form of symbolic food placed on the Passover Seder Plate, which is usually a roasted shankbone. The eating of the afikoman substitutes for the eating of the Korban Pesach at the end of the Seder meal. Many Sephardi Jews have the custom of eating lamb or goat meat during the Seder in memory of the Korban Pesach. Chametz (חמץ, "leavening") refers either to a grain product that is already fermented (e.g. yeast breads, certain types of cake, and most alcoholic beverages), or to a substance that can cause fermentation (e.g. yeast, sourdough or high fructose corn syrup). The consumption of chametz is forbidden during Passover in most Jewish traditions. According to Halakha, the ownership of chametz is also proscribed. To remove all chametz from one's home, including things made with chametz, before the first day of Passover. ( ). It may be simply used up, thrown out (historically, destroyed by burning, since there was no weekly garbage pickup in ancient times), or given or sold to non-Jews (or non-Samaritans, as the case may be). To refrain from eating chametz or mixtures containing chametz during Passover. ( , , ). Not to possess chametz in one's domain (i.e. home, office, car, etc.) during Passover ( , ). Observant Jews typically spend the weeks before Passover in a flurry of thorough housecleaning, to remove every morsel of chametz from every part of the home. The Halakha requires the elimination of olive-sized or larger quantities of leavening from one's possession, but most housekeeping goes beyond this. Even the cracks of kitchen counters are thoroughly scrubbed, for example, to remove any traces of flour and yeast, however small. Any item or implement that has handled chametz must then be fully cleansed to remove all traces of chametz from them. This is usually accomplished through heat: either by directly heating the implements or by subjecting them to boiling water. Some Jewish bakeries subject their ovens to blowtorches until they glow red hot (a process called libun gamur). Traditionally, Jews do a formal search for remaining chametz (bedikat chametz) after nightfall on the evening before Passover. A blessing is read (על ביעור חמץ - al biyur chametz, "on the removal of chametz"), and one or more members of the household proceed from room to room to check that no crumbs remain in any corner. In very traditional families, the search may be conducted by the head of the household; in more modern families, the children may be the ones who do the search, under the careful supervision of their parents. Because the house is assumed to have been thoroughly cleaned by the night before Passover, there is some concern that making a blessing over the search for chametz will be for naught ("bracha l'vatala") if nothing is found. Thus, 10 morsels of bread smaller than the size of an olive are traditionally hidden throughout the house in order to ensure that there some chametz will be found. Chametz may be sold rather than discarded, especially in the case of relatively valuable forms such as liquor distilled from wheat, with the products being repurchased afterward. In some cases, they may never leave the house, instead being formally sold while remaining in the original owner's possession in a locked cabinet until they can be repurchased after the holiday. Although this practice dates back many years, some contemporary rabbinical authorities have come to regard it with disdain - since the supposed "new owner" never takes actual possession of the goods. The sale of chametz may also be conducted communally via a rabbi, who becomes the "agent" for all the community's Jews through a halakhic procedure called a kinyan (acquisition). Each householder must put aside all the chametz he is selling into a box or cupboard, and the rabbi enters into a contract to sell all the chametz to a non-Jewish person (who is not obligated to observe the commandments) in exchange for a small down payment (e.g. $1.00), with the remainder due after Passover. This sale is considered completely binding according to Halakha, and at any time during the holiday, the buyer may come to take or partake of his property. The rabbi then re-purchases the goods for less than they were sold at the end of the holiday. Observant Jewish store owners who stock leavened food products sell everything in their storeroom in this fashion with the full knowledge that the new owner is entitled to claim the property. In Eastern European shtetls, Jewish tavernkeepers, would sell their alcoholic chametz and risk having their neighbors enter their cellars to drink the liquor. Following the formal search for chametz, any leavened products that were found during the search, along with 10 morsels of bread, are burned (s'rayfat chametz). The head of the household declares any chametz that may not have been found to be null and void "as the dust of the earth" (biyur chametz). Should more chametz actually be found in the house during the Passover holiday, it must be burnt as soon as possible. Matzo has also been called Lechem Oni (Hebrew: "poor man's bread"). There is an attendant explanation that matzo serves as a symbol to remind Jews what it is like to be a poor slave and to promote humility, appreciate freedom, and avoid the inflated ego symbolized by leavened bread. the weeks before Passover, matzos are prepared for holiday consumption. In Orthodox Jewish communities, men traditionally gather in groups ("chaburas") to bake a special version of handmade matzo called "shmura matzo", or "guarded matzo", for use at the Seder. These are made from wheat that is guarded from contamination by chametz from the time of summer harvest to its baking into matzos five to ten months later. Shmura matzo dough is rolled by hand, resulting in a large and round matzo. Chaburas also work together in machine-made matzo factories, which produce the typically square-shaped matzo sold in stores. The baking of shmura matzo is labor-intensive, as only 18–22 minutes is permitted between the mixing of flour and water to the conclusion of baking and removal from the oven; however, most are completed by 5 minutes after first being kneaded. Consequently, only a small amount of matzos can be baked at one time, and the chabura members are enjoined to work the dough constantly so that it is not allowed to ferment and rise. A special cutting tool is run over the dough just before baking to keep the matzos flat while baking; this creates the familiar dotted holes in the matzo. After the matzos come out of the oven, the entire work area is scrubbed down and swept to make sure that no pieces of old, potentially leavened dough remain, as any stray pieces are now chametz, and can contaminate the next batch of matzo. Due to the strict separation between matzo products and chametz during Passover, observant families typically own complete sets of serving dishes, glassware and silverware for use only during Passover. Under certain circumstances, some chametz utensils can be immersed in boiling water (hagalat keilim) to purge them of any traces of chametz may have accumulated during the year. Many Sephardic families thoroughly wash their year-round glassware and then use it for Passover, as the Sephardic position is that glass does not absorb enough traces of food to present a problem. On the morning before Passover, the fast of the firstborn takes place. This fast commemorates the salvation of the Hebrew firstborns during the Plague of the Firstborn (according to the Book of Exodus, the tenth of ten plagues wrought upon ancient Egypt prior to the Exodus of the Children of Israel), when, according to Exodus (12:29): "...God struck every firstborn in the Land of Mitzrayim (ancient Egypt)...." Many authorities, including the Rema, note the custom that fathers of firstborn sons are required to observe the fast if their son has not yet reached the age of Bar Mitzvah. In practice, however, most firstborns only fast until the end of the morning prayer service in synagogue. This is due to the widespread custom for a member of the congregation to conduct a siyum (ceremony marking the completion of a section of Torah learning) right after services and invite everyone to partake in a celebratory meal. According to widespread custom, partaking of this meal removes one's obligation to fast. If the firstborn is a boy in a Jewish family, that boy will have to fast after he has his Bar Mitzvah. These 15 parts parallel the 15 steps in the Temple in Jerusalem on which the Levites stood during Temple services, and which were memorialized in the 15 Psalms (#120-134) known as Shir HaMa'alot ( , "Songs of Ascent"). commandment to eat Maror, bitter herbs (typically, horseradish, romaine lettuce, or green onions), together with matzo and the Passover sacrifice . In the absence of the Temple , Jews cannot bring the Passover sacrifice. This commandment is fulfilled today by the eating of Maror both by itself and together with matzo in a Koreich-sandwich during the Passover seder. There is a Rabbinic requirement that four cups of wine (or grape juice) are to be drunk during the seder. This applies to both men and women. The Mishnah says (Pes. 10:1) that even the poorest man in Israel has an obligation to drink. 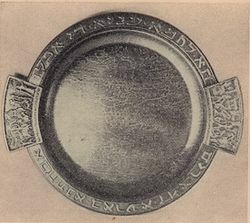 Each cup is connected to a different part of the seder: the first cup is for Kiddush, the second cup is connected with the recounting of the Exodus, the drinking of the third cup concludes Birkat Hamazon and the fourth cup is associated with Hallel. In Israel, Passover lasts for seven days with the first and last days being major holidays. In Orthodox and Conservative communities, no work is performed on those days, with most of rules relating to the observances of Shabbat being applied. A seder is held on the first day. Outside Israel, in Orthodox and Conservative communities, the holiday lasts for eight days with the first two days and last two days being major holidays. A seder is conducted twice, on both the first and second days. In the intermediate days necessary work can be performed. Reform Judaism observes Passover over seven days, with the first day being a major holiday when a seder is held. Like the holiday of Sukkot, the intermediary days of Passover are known as Chol HaMoed (festival weekdays) and are imbued with a semi-festive status. It is a time for family outings and picnic lunches of matzo, hardboiled eggs, fruits and vegetables, and Passover treats such as macaroons and homemade candies. The prohibition against eating leavened food products and regular flour during Passover results in the increased consumption of potatoes, eggs and oil in addition to fresh milk and cheeses, fresh meat and chicken, and fresh fruit and vegetables. To make a "Passover cake," recipes call for potato starch or "Passover cake flour" (made from finely granulated matzo) instead of regular flour, and a large amount of eggs (8 and over) to achieve fluffiness. Cookie recipes use matzo farfel (broken bits of matzo) or ground nuts as the base. For families with Eastern European backgrounds, borsht, a soup made with beets, is a Passover tradition. Some hotels, resorts, and even cruise ships across America , Europe and Israel also undergo a thorough housecleaning to make their premises "kosher for Pesach" to cater for observant Jews. Beginning on the second night of Passover, the 16th day of Nissan, Jews begin the practice of the Counting of the Omer, a nightly reminder of the approach of the holiday of Shavuot 50 days hence. Each night after the evening prayer service, men and women recite a special blessing and then enumerate the day of the Omer. On the first night, for example, they say, "Today is the first day in (or, to) the Omer"; on the second night, "Today is the second day in the Omer." The counting also involves weeks; thus, the seventh day is commemorated, "Today is the seventh day, which is one week in the Omer." The eighth day is marked, "Today is the eighth day, which is one week and one day in the Omer," etc. When the Temple stood in Jerusalem , a sheaf of new-cut barley was presented before the altar on the second day of Unleavened Bread. Josephus writesOn the second day of unleavened bread, that is to say the sixteenth, our people partake of the crops which they have reaped and which have not been touched till then, and esteeming it right first to do homage to God, to whom they owe the abundance of these gifts, they offer to him the first-fruits of the barley in the following way. After parching and crushing the little sheaf of ears and purifying the barley for grinding, they bring to the altar an assaron for God, and, having flung a handful thereof on the altar, they leave the rest for the use of the priests. Thereafter all are permitted, publicly or individually, to begin harvest. Since the destruction of the Temple, this offering is brought in word rather than deed. One explanation for the Counting of the Omer is that it shows the connection between Passover and Shavuot. The physical freedom that the Hebrews achieved at the Exodus from Egypt was only the beginning of a process that climaxed with the spiritual freedom they gained at the giving of the Torah at Mount Sinai. Another explanation is that the newborn nation which emerged after the Exodus needed time to learn their new responsibilities vis-a-vis Torah and mitzvot before accepting God's law. The distinction between the Omer offering—a measure of barley, typically animal fodder—and the Shavuot offering—two loaves of wheat bread, human food—symbolizes the transition process. Shvi'i shel Pesach (שביעי של פסח "seventh [day] of Passover") is another full Jewish holiday, with special prayer services and festive meals. Outside the Land of Israel in the Jewish diaspora, Shvi'i shel Pesach is celebrated on both the seventh and eighth days of Passover. This holiday commemorates the day the Children of Israel reached the Red Sea and witnessed both the miraculous "Splitting of the Sea," the drowning of all the Egyptian chariots, horses and soldiers that pursued them, and the Passage of the Red Sea. According to the Midrash, only Pharaoh was spared to give testimony to the miracle that occurred. The "Second Passover" (Pesach Sheni) on the 14th of Iyar in the Hebrew Calendar is mentioned in the Hebrew Bible (Numbers 9:6-13) as a make-up day for people who were unable to offer the pesach sacrifice at the appropriate time due to ritual impurity or distance from Jerusalem . Just as on the first Pesach night, breaking bones from the second Paschal offering (Numbers 9:12) or leaving meat over until morning (Numbers 9:12) were prohibited. Today, Pesach Sheni on the 14th of Iyar has the status of a very minor holiday (so much so that many of the Jewish people have never even heard of it, and it essentially does not exist outside of Orthodox and traditional Conservative Judaism). There are not really any special prayers or observances that are considered Jewish law. The only change in the liturgy is that in some communities Tachanun, a penitential prayer omitted on holidays, is not said. There is a custom, though not Jewish law, to eat just one piece of Matzah on that night. The holy day of the Christian feast of Easter is actually called "Passover" (or a derivative) in most languages other than English and German, and its central theme is that Christ was the paschal lamb in human form - a human sacrifice by god. ( ) Additionally, the Synoptic Gospels relate that Christ's Last Supper was a Passover seder. ( )With a few sectarian exceptions, the date of Easter was always determined by taking into account the same lunisolar cycles. Since the 4th-5th centuries CE, the most approved method has used a 19-year cycle of lunar months to set Easter to the first Sunday following the first full moon falling on or after the spring equinox, the full moon being reckoned functionally as the 14th of the lunar month, and the equinox being reckoned functionally as March 21. Because of the drift of the seasons and lunations under the Julian calendar, over the centuries the Easter cycle fell out of synchronization with the sun and moon. But the Gregorian reforms restored the equinox to March 21 and corrected the tabulated lunar cycles, so that the Gregorian calendar's Easter is almost always the same as would be computed by more precise astronomical computations. Gregorian Easter usually falls up to seven days after Passover, but in years 8, 11, and 19 of the Hebrew calendar's 19-year cycle, (corresponding respectively to years 11, and 14, and 3 of the Christian 19-year cycle) Passover falls about a month after Gregorian Easter. Similarly, because the solar year of the Julian calendar is too long compared to the spring equinox year, Orthodox Easter occurs about a month after Gregorian Easter in years 3, 8, 11, 14 and 19 of the Christian 19-year cycle. Three of these years (3, 11, and 14) correspond to years in which Passover is about a month after Gregorian Easter. So in these years (years 19, 8, and 11 of the Hebrew calendar's cycle) Passover will occur in the same lunation as Julian (Eastern Orthodox) Easter. However, because the Julian calendar's tabulated lunar months are now 3 to 5 days behind the astronomical facts, Passover even in these years will always precede Orthodox Easter. In years 8 and 19 of the Christian cycle (corresponding to years 5 and 16 of the Hebrew calendar's cycle), Passover and Gregorian Easter will be in the same lunation, and Julian Easter will be a lunation later. This state of affairs will continue until 2199, after which the Gregorian epacts will shift. Beginning in 2200, Passover will be a month after Gregorian Easter in four years out of nineteen - in years 3, 8, 11, and 19 of the Jewish cycle (corresponding respectively to years 6, 11, 14, and 3 of the Gregorian cycle). Jehovah's Witnesses worldwide do not observe Easter but, instead, observe only the Last Supper on the first evening of Passover; they do not necessarily use the same date as the modern Jewish calendar, but it sometimes corresponds with the same full moon as the festival of Purim. Church of God World Mission Society celebrates Passover according to the instruction given by Jesus Christ in the New Testament (Matt 26 and Luke 22) every year January 14 sacred calendar. According to the new testament, the children of God and the great multitude will celebrate the Passover in the last days.